There are days where I wake up ready for a challenge in the kitchen. 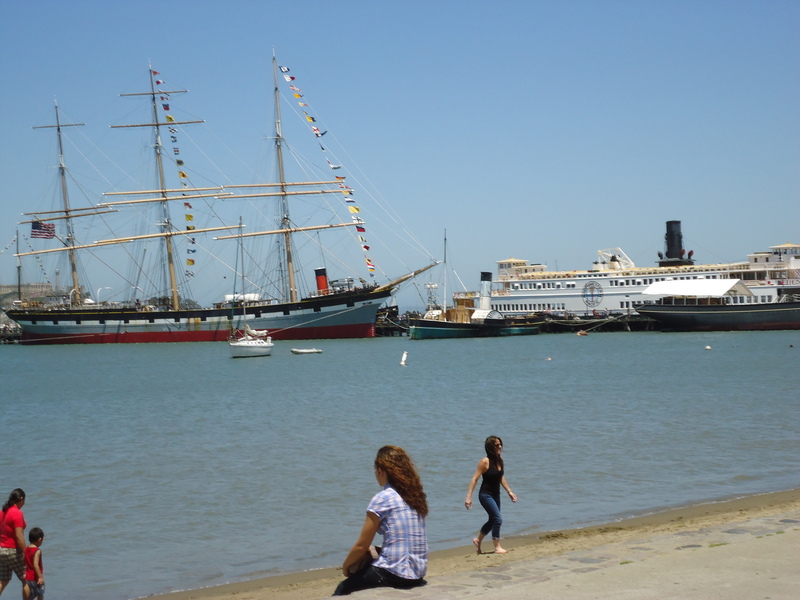 I want to experiment with something new and discover uncharted territory. This is one of those days. 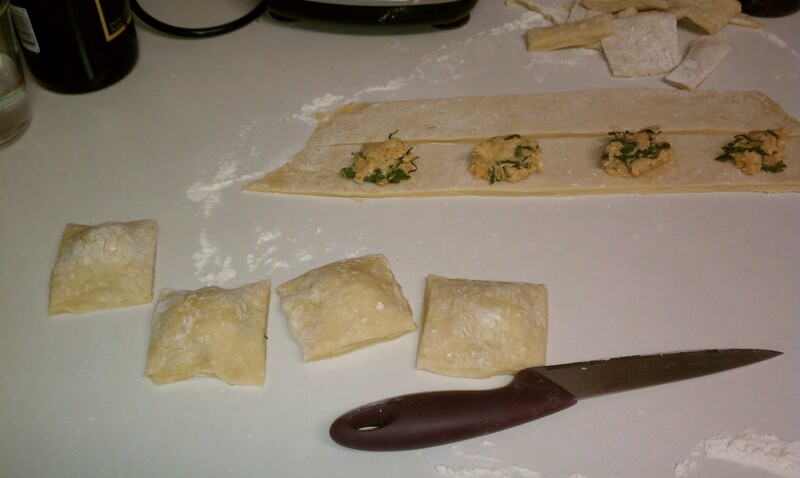 Brace yourself, because we are making homemade ravioli! Oh, and not just any ravioli, veg-friendly Sweet Potato Ricotta and Arugula Ravioli. First things first, let’s get the sweet potato going. That way we can cut down the time spent on this recipe, and get closer to the eating part. After washing and drying your sweet potato, poke several rows of holes in the top with a fork. Put the sweet potato directly on the oven rack and bake in a pre-heated 400 degree oven for 1 hour. While that’s cooking you can multi-task, and start on the ravioli dough. I always thought making my own pasta would be an impossible feat, and that the process would be overwhelmingly complicated. I’m happy to say, this is not the case. 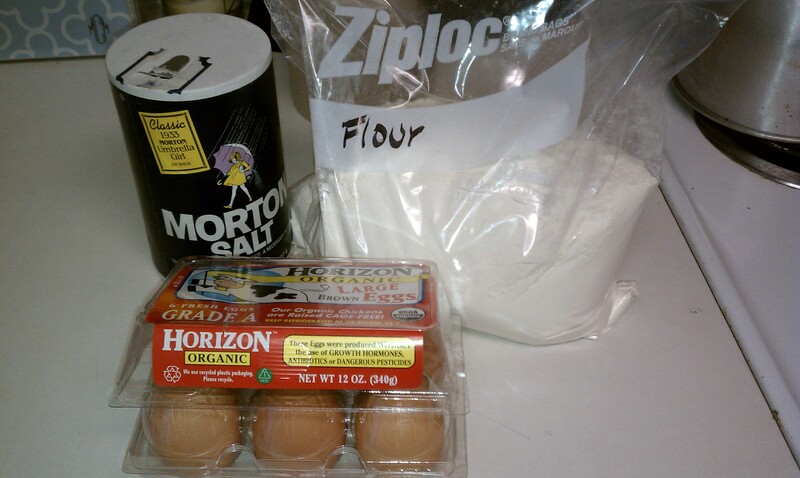 All you need is 3 ingredients to make a basic dough: flour, eggs, and salt. 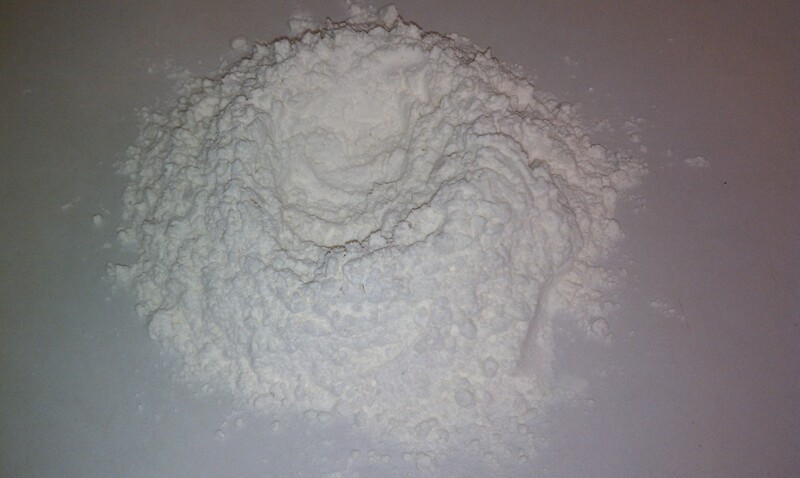 On a clean countertop, pour 1/2 cup of flour. Add a sprinkle of salt over the flour and mix in with your hands. 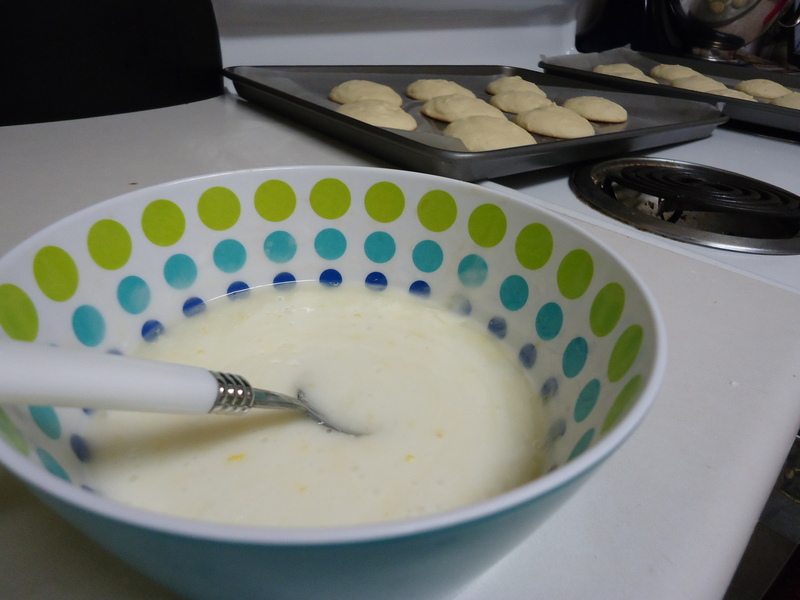 Cup the flour with your hands and make a circle. Then push out from the middle to make a well. Crack 2 eggs in the center of your well and slowly start pulling the flour into the egg with your fingers a little at a time. The egg mixture will be very sticky at first. 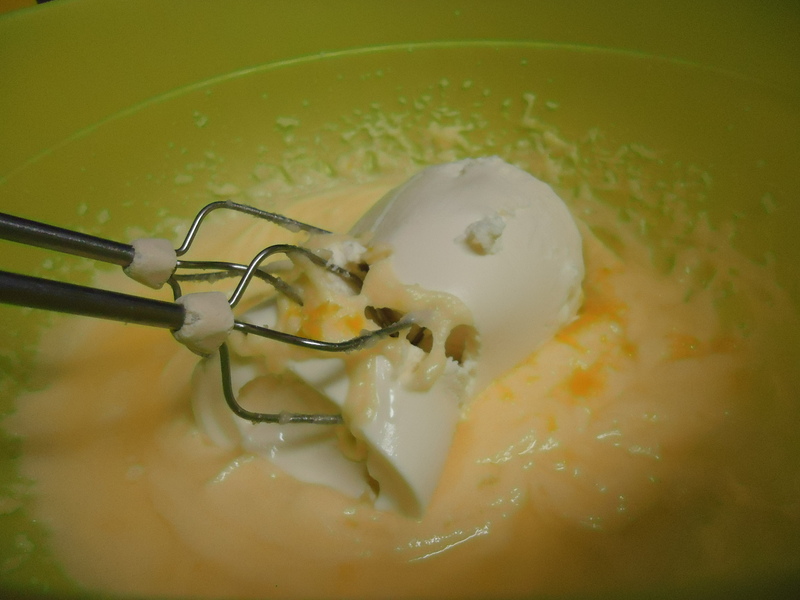 You will end up with dough after just a few minutes of mixing the ingredients. 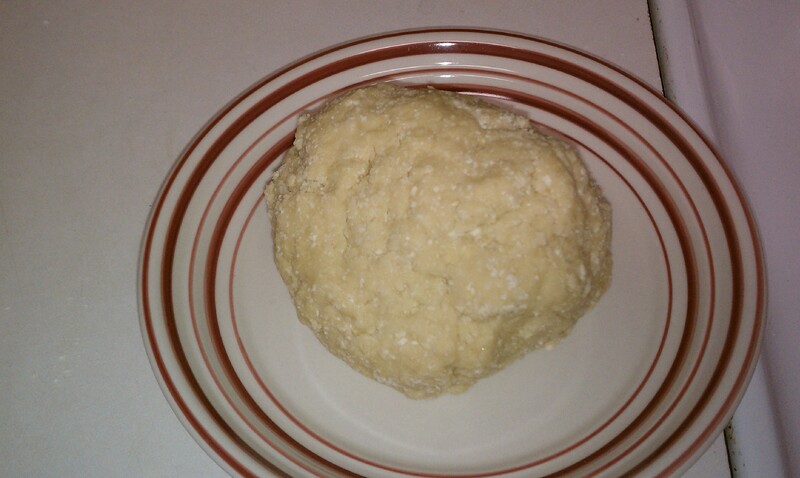 My dough was still a little sticky and I just added a sprinkle more flour to get it to the right consistency. You should then form a dough ball and cover your masterpiece with a wet paper towel for 45 minutes. The dough process took me about fifteen minutes. This means that your baked sweet potato and ravioli dough should both be ready in about 45 more minutes. You have two options for the next 45 minutes. Option 1: clean up your counter, your hands, and get started on the rest of the filling. Option 2: watch an episode of Top Chef on your dvr to feel inspired, and do the cleanup afterwards. I went with option 1, because I have a small apartment kitchen and needed the clean space for later. Told you I love to multitask! Now for the other half of the filling. In a medium-sized pan, heat 1 tbs of olive oil on medium heat. Then add 1 tbs of chopped garlic and cook for 1-2 minutes. 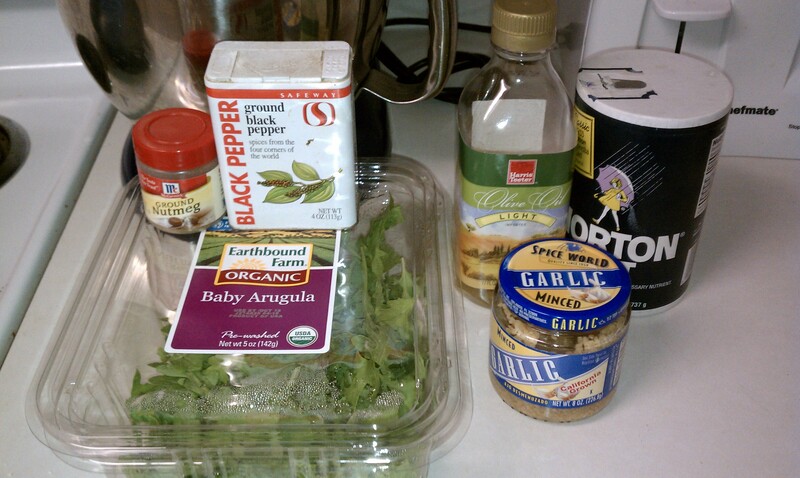 Add your arugula, 1/4 tsp of nutmeg, 1/2 tsp of salt, and 1/2 tsp of pepper to the garlic. 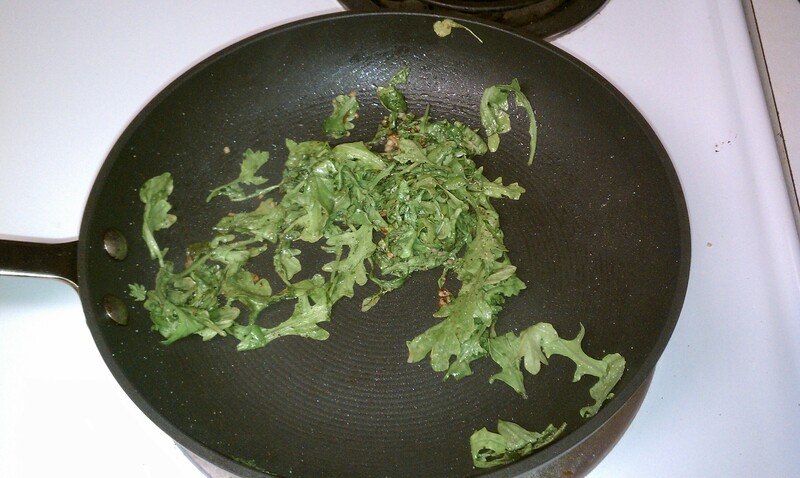 Stir this all together to wilt your greens. You will notice they cook up rather quickly and reduce in size. Take your wilted arugula off the heat and put on a back burner. You’ll come back to it in a minute. 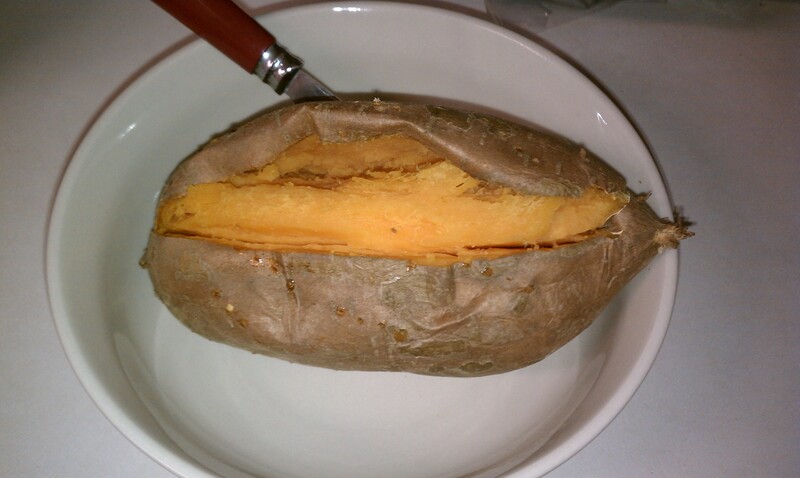 Scoop out the inside of your baked sweet potato and transfer it to a large cereal bowl or small mixing bowl. 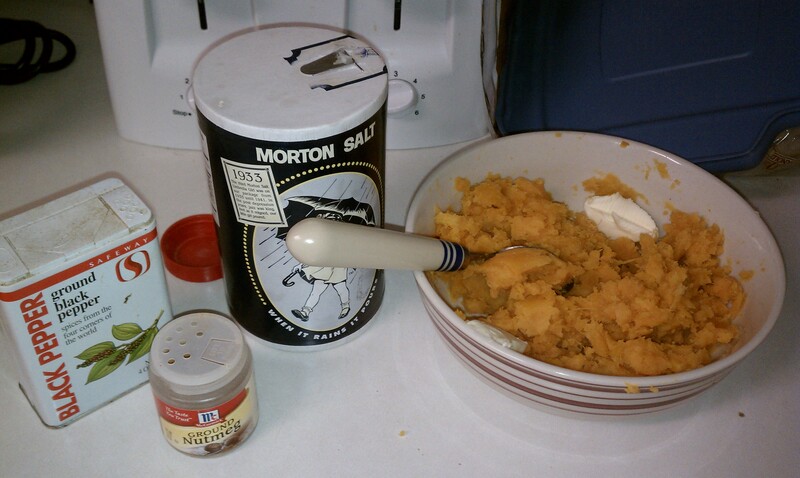 Mix the sweet potato with a sprinkle of nutmeg, the other 1/2 tsp of salt, 1/2 tsp of pepper, and 1 tbs of butter. 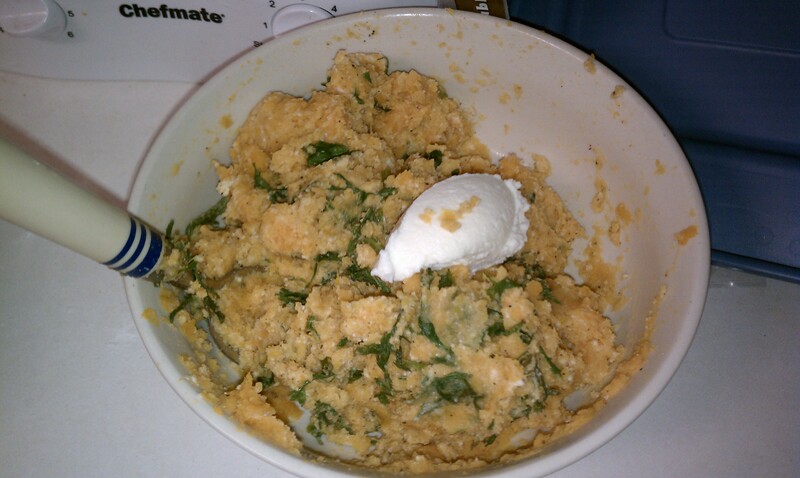 Now add the garlic arugula mixture to the sweet potato, and also 3 tbs of ricotta cheese. Mix well and taste to make sure your filling doesn’t need additional seasoning. Set filling aside and let’s get back to our ravioli dough. Sprinkle a little flour on your counter and on a rolling pin. You don’t want your dough to stick! You can also use a wine bottle if you don’t have a rolling pin available. Roll out your dough, starting in the center and working your way out. This will take a few minutes (and some patience), as you want your dough to be very thin. Now use a pizza cutter or a knife to cut rows into the dough. The rows should be about the same length and width. They will be the top and bottom of your ravioli. Think about the size of your ravioli, and spoon a tsp of filling out across the dough. I had 4 blobs of filling for each strip of dough. You want to leave plenty of room between the filling. 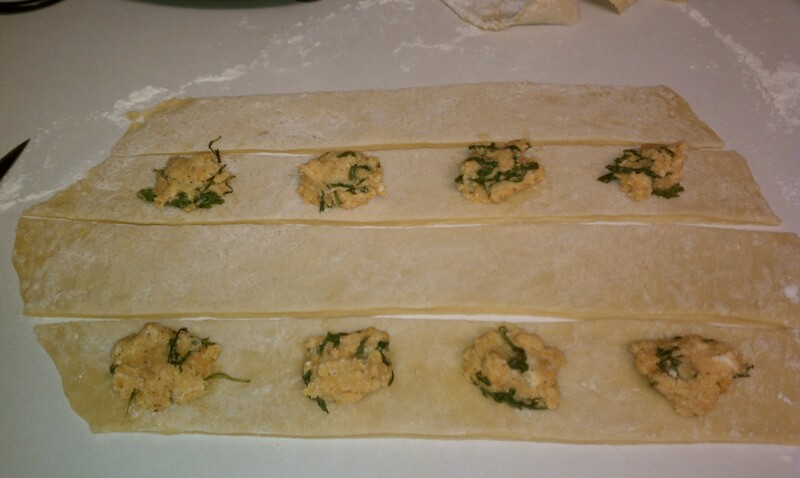 Take the top piece of dough and put it over the dough with filling. Gently press down and pinch the dough around the filling to make a little pouch. You want to make sure it’s sealed properly so the filling doesn’t leak out later. I used a fork and pressed around the edges to get a good seal and pretty rustic design. Repeat this process until you have finished assembling your ravioli. 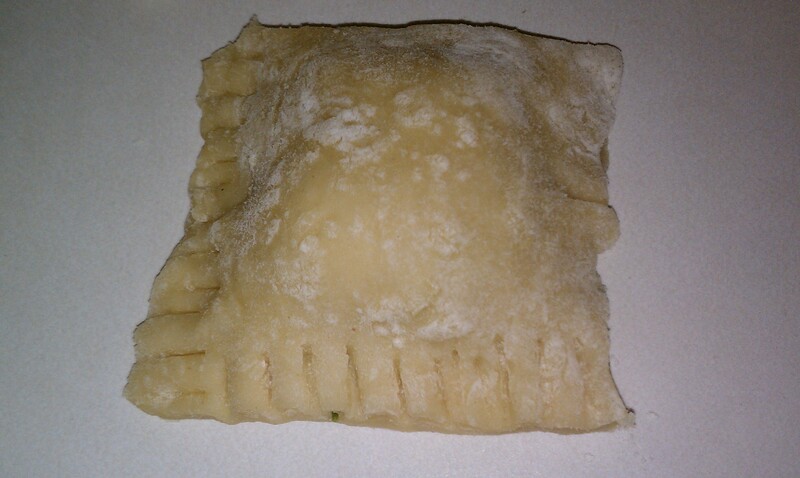 I used my scraps of dough to make one extra piece of ravioli. Bring a small pot of water to a boil and put in a few pieces of ravioli to cook. Make sure not to overcrowd the pot. 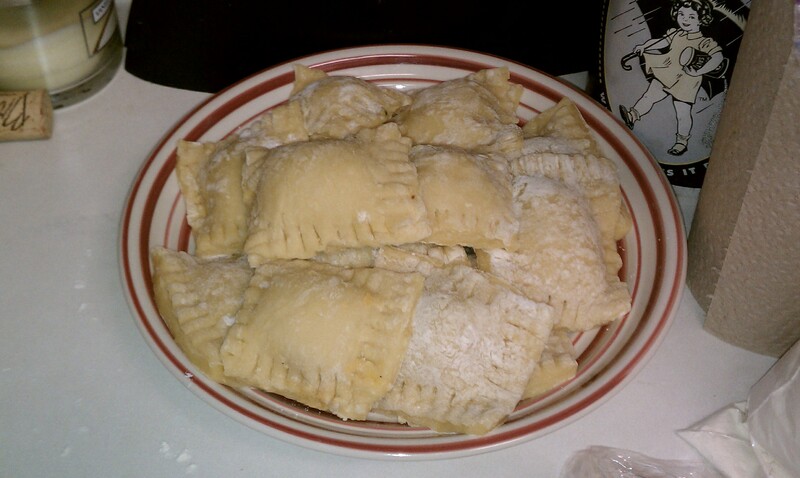 The ravioli should take about 6-7 minutes to cook, and will look pale in color. Take one out and test with your fork to make sure it’s cooked and the pasta dough is light. 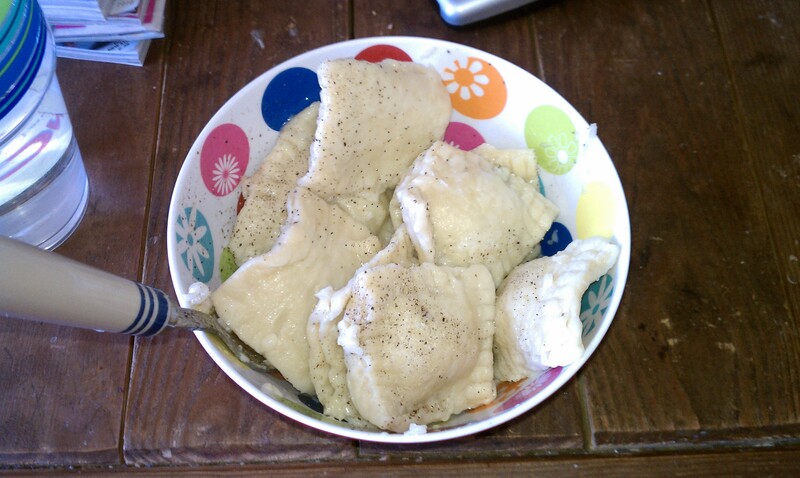 I used a drizzle of olive oil, black pepper and red pepper flakes to finish my ravioli. You could also use marinara sauce. 1. I baked my sweet potato, but you could also microwave it for 6 minutes on high if you are pressed for time. Remember to poke holes in the sweet potato with a fork (or it will explode), and expect a little whistling. 2. You can make the filling the night before and keep it in the fridge covered with cling wrap. 3. Please please please make sure to roll out a thin dough. I was impatient (surprised? ), and left mine a little too thick. This meant each piece had to cook for longer and my ravioli were a bit dense. My experiment was so delicious! I learned from my dough mistakes, and can’t wait to try it again. Oh, and don’t feel bad about eating any leftover filling straight from the bowl. It was just as good this way, and I might offer it up as a side for my veg sister at Thanksgiving next year!